Our experienced, qualified and professional consultants assess, advise and provide training to ensure your business and its people are equipped with the knowledge they need to take your business forward together. Respected experts in organisational development, management and leadership, our business coaches combine professional and academic education in the field with practical experience of organisational development, management and leadership in some of the most challenging and complex environments. Students from a range of industries benefit enormously from each trainer’s wealth of expertise and the unique learning style in which each training course is delivered. Our range of recruitment and selection, leadership and management training packages can be delivered off-the-shelf or tailored to your specific needs. To find out more about how our recruitment and selection, leadership and management training can benefit your organisation and staff, click on the sections below on this page. You can also call us on 07801 387202 or send a message on our Contact page. Our comprehensive Recruitment and Selection Training courses have been designed so that participants can work with our hands-on techniques and tools covered. Activities have been set in such a way that knowledge can be tested throughout the duration of the training and additional material and content provided if needed to ensure that a true understanding of the material is met, therefore providing a greater chance of the learning being implemented upon return to work. Our courses can be adapted as 1 day or 2 days, depending on the depth of training required by the client. Our one-day course is ideal for managers who have a limited knowledge of the methodologies used in recruitment and selection. We aim to develop skills and knowledge for our attendees so that they can confidently interview new team members, produce accurate assessment and gain a better understanding of the whole selection process. Our 2-day course provides additional and more extensive competency based interview techniques. If you’re a leader or manager in today’s fast paced, high pressured world, you’ll no doubt be facing many challenges and have high expectations to achieve results. You’ll probably have people to manage, be responsible for their performance, have objectives to achieve, decisions to make and numerous problems to solve. Invariably your performance will be the key to your success and the ongoing success of your team or department. There is a great deal of management theory out there, but what does it mean in practical terms? How can it be applied to your situation? It’s ok learning the theory, but if you’re not sure how to apply it in real work situations, you’ll probably revert to how you used to do things. If this sounds like you, we have the skills and experience to help. We identify your specific needs and deliver a training course that meets your requirements. You or your leaders and managers will benefit from a training course that applies theory to practical situations, is interactive, engaging and consists of dynamic and interesting exercises delivered in a safe learning environment. 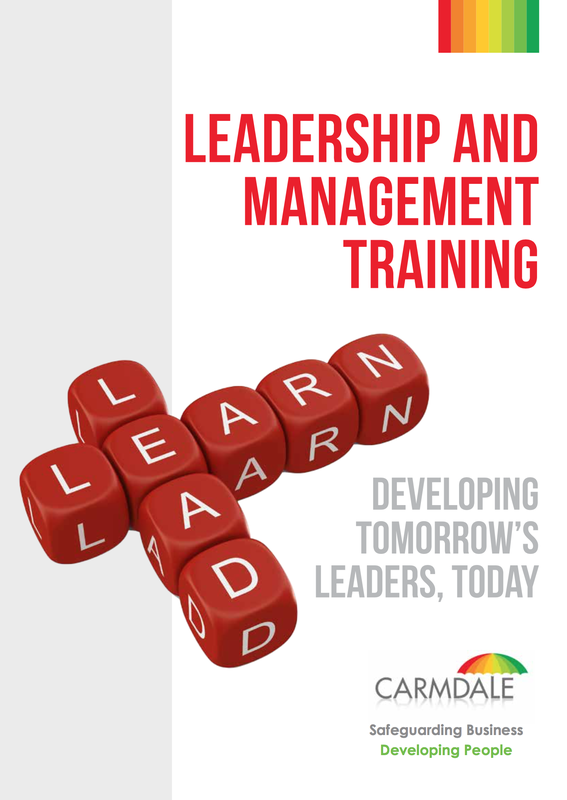 To find out more about how our leadership and management training can benefit your organisation and staff, click on the link to download our brochure. Working with a mentor brings significant benefits to all leaders regardless of their years of experience. We have leadership mentoring programmes designed for new, aspiring and experienced leaders who need support and guidance at each stage of their career. We help you through periods of change and guide you through new situations and challenging targets. All Carmdale mentors are experienced leaders and qualified to Masters Level in coaching and leadership mentoring (Level 7). Throughout their varied and successful careers, there are few scenarios that our mentors have not already experienced making them well equipped to help you. New leader mentoring – To provide advice and guidance throughout the key stages of your new leadership role, or to provide mentoring to help you secure the leadership role that you aspire to. Mentoring through change – To help you work through a period of significant change, or where you, as the leader, may be the person driving the change. Mentoring through personal development – Perhaps you are learning new skills or qualifications and would benefit from a mentor to support you throughout the process. Mentoring for specific roles – We can provide you with a mentor to complement the role that you perform in your organisation. Career mentoring – We will provide you with the support you need to make informed decisions and choices to continue on your chosen career path. For more details on our leadership mentoring programme, click here to download our pdf brochure. If you require further assistance or have any questions, please do not hesitate to contact us on 07801 387202 or send a message on our Contact page.